• A new instalment in The English Kitchen series •People think of tripe as just another dreary post-war substitute for real food, one of the worst aspects of food rationing. But it has a long and glorious history as a staple of working-class diet in the industrial towns of Lancashire and northern England. It was never a new invention of the Industrial Revolution, but its cheapness and nutritional value gave it a new significance among cotton workers and other factory hands. All through Lancashire there arose large numbers of tripe dressers (often back-room businesses) and tripe restaurants (often of surprising ornateness and magnificence). All this disappeared with our growing affluence in the sixties and seventies and tripe is (almost) now restricted to chefs exploring the byways of butchery and to people with long memories. Of course, it was never specifically English: lots of other cultures embraced tripe cookery and made classics of the dish – not least the French (Tripes à la mode de Caen) and the Turkish market workers who still rejoice in tripe soup of a morning. 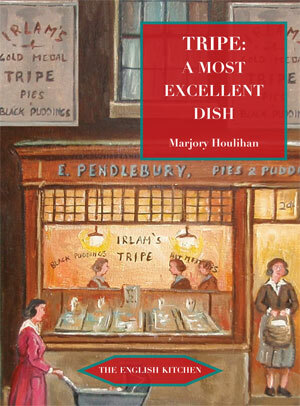 Marjory Houlihan’s charming and instructive book tells the story of tripe in Lancashire as well as giving recipes from around the world. It was first published in Bolton in 1988 but this is the first time it has been given national distribution. So that a fuller picture is available, we have also printed Roy Shipperbottom’s essay on the tripe restaurants of Lancashire and Lynda Brown’s essay on the cooking of cow’s udder (elder) in the north country. We forget the richness of England’s food history and food culture and this book, with others in ‘The English Kitchen’ series, goes some way to redress the balance. A PDF of the preliminaries and samples pages from the whole book. Lately there has been a gastronomic trend towards offal, partly inspired by the current economic strife and the subsequent tightening of purse strings, but also progressed by the slew of authors and journalists discussing the nature of nose-to-tail eating, this book serves as a fitting historical accompaniment, exploring tripe’s place in the working towns and cities of northern England. The reviews of this book, though few, have been positive in noting its social historical relevance. This brief yet elegantly designed book reprints Houlihan’s 1988 history of the Lancashire tripe trade, together with Roy Shipperbottom’s essay on the “Decline of Tripe” and a 1987 piece by Lynda Brown on “Elder: ‘A Good Udder to Dinner’” (the quote is from Pepys). Houlihan was inspired by a conversation with a neighbour: “When I were a girl, mi mother kept a trip shop up Halliwell, an that’s summat y’never see these days.” In 1906, Manchester had 260 tripe shops. By 1994 there were none. Tripe is the first or second stomach of a ruminant, particularly an ox. Athenaeus and Homer praised tripe and William the Conqueror was partial to it. The fast food of its day, this “cheap and nourishing” food has played an important part in “making the north and midlands the workshops of Britain”. Houlihan’s study is a gem, bringing together interviews with those who remember the tripe trade (”Don’t talk tripe – Eat it!” was one firm’s slogan), old adverts and photos, as well as recipes, including the intriguingly named Tripe Wiggle. The final newspaper review comes from the Bristol Evening Post which gives some insight into the difficulty of sourcing tripe in a time when consumers are used to more select cuts of meat. This week saw the publication of a new book devoted entirely to the subject of tripe and it makes for fascinating reading.Tripe: A Most Excellent Dish, by Marjory Houlihan (Prospect Books, £9.99), was first published in Bolton, Lancashire, in 1988, but now it has been given national distribution thanks to Tom Jaine’s Devon-based Prospect Books. The book traces the history of tripe, which came to prominence as a working-class staple in the industrial towns of Lancashire. It is amazing to think that in 1906, there were 260 specialist tripe shops in Manchester alone. Today, there are none. These days, tripe tends to only appeal to older people who can remember eating it after the war, or inventive chefs rediscovering what has been described as “ration-book meat cuts”. Sadly, tripe is increasingly hard to source. This week, I phoned a number of Bristol butchers and none of them stocked it simply due to a lack of demand from customers. Only Henry Herbert of Hobbs House Butchers in Chipping Sodbury had tripe in stock and he told me it still sells well. ”We sell tripe most weeks and although it tends to be older people who buy it, it shouldn’t just be regarded as a food of our grandparents,” he says. I would be interested to hear from any other local butchers who sell tripe or other forgotten cuts of meat. In the meantime, for those lucky enough to have a regular supply of this much- neglected delicacy, here are two simple recipes from Tripe: A Most Excellent Dish – a book that deserves to be in the Christmas stocking of the tripe lover in your life. Tripe has always been considered to be a poor substitute for real food, particularly in the post war years. However, as this book shows it has had a rich history of being the staple of a working class diet in the North of England.This charming book tells the real story of tripe and provides some recipes for tripe from around the world. It reminds readers of the rich and varied history of English food.